Contract Details: 1 year initial contract. Signed 1 year extension on 31st December 2012 with a likely end date of 31st March 2014. Individual Awards: A-League All Star (2012/13). Team Honours: A-League Premiership Winner (2012/13). Highlight: Scored the first ever Wanderers own-goal against Melbourne Victory, Round 8 of Season 2012/13 on 24/11/2012. Highlight: Scored his first goal for the Wanderers in the 2nd Sydney Derby, Round 11, Season 2012/13 on 15/12/2013. Description: A veteran central defender with European and International experience. 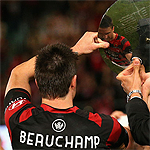 He has joined the club from cross-town rivals Sydney FC and was named Captain for the inaugural season. After leaving the Wanderers he joined PTT Rayong, playing one season before retiring.